Fun network of trails crosses desert and foothills. 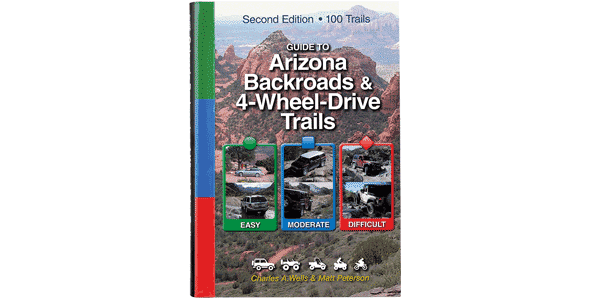 A widespread trail system that meanders across undulating desert and low foothills. Pay close attention to directions as numerous roads and washes branch off at many points. Pass several mines and a roofless stone cabin. Trail sees little traffic, so make sure you have plenty of water and supplies. Ride north and south for many miles following Hassayampa River bed. Hard-packed dirt and gravel with occasional rocky sections. Soft sand in river bed. Brush marks likely. Aggressive SUVs only. After Waypoint 5: “brush marks likely” (p. 112) has gotten worse. Expect scratches from the brush. No problems on the trail for a first timer in a stock 94 Toyota four-runner, easy to follow. Mileage and concordance in book are accurate.